Dive in the world of fantasy, only coming out gasping into reality. “I don’t need to be dropped anywhere, okay? You go where you have to go and leave me be. ” Khushi’s eyes spit fire as she said this. How dare he admit he had a hot date,but was only being polite while suggesting he dropped her off home! As if she was a child that needed his minding. She was not going to have any of this nonsense if they got engaged. A sharp retort sprang to her lips, but Khushi held it back and closed her mouth shut, her eyes wide. She was completely mental if she was in angry because he was going out with someone else. She just couldn’t be jealous! “What, no come back? Not even a tiny retort. ” Arnav mocked her. “No. ” Khushi gave a clipped reply, and heard his breath intake. Khushi stared straight ahead, walking on, trying to blank out the smell of him. He affected her in so many ways, more than anyone else. He riled her up, made her smile and he made her feel very desirable too. Not that she was going to give in to this attraction. That way lay destruction and heart break. She was not going to fool herself into thinking she was in love; it was plain and simple attraction. “What are you thinking about? I can hear your brain engines whirring. ” ASR tried to start a conversation. “Just thinking something, and I really don’t want to talk about it. ” Khushi replied softly but firmly. “Nahi? Now that’s strange, because if you were going out on a date, I would want to beat the guy to the pulp. When I saw you with Jha the first time, I wanted to break his jaw when he smiled at you and break his hand when he caught yours. ” Pat came Arnav’s reply. And Khushi blushed to the roots of her hair, muttering “I knew it was going to be my fault somehow.” and meekly walked along with him to the car. And he drove away, leaving her outraged and open mouthed at her doorstep. Meanwhile Payal watched what was happening between Arnav Singh Raizada and Khushi and a chuckle left her as he drove away. That man was devious and Khushi was totally wrapped up in him, just like he was in her- thought Payal. She had her suspicions about him being aware of his feelings, unlike Khushi. Only time would tell though, how things pan out. Sighing, Payal turned away from the window and went ahead to open the door, only to have Khushi knocking her on the nose, lost in her own world. Giving Payal a sheepish grin, Khushi rushed into her room to shower and change. Twenty minutes later they left the house in the taxi, dressed smart and ready to enjoy their evening dinner at Pind Balluchi, in Connaught Place. While Payal was dressed in a lacy bodycon dress in black and a crocheted cream scarf to go with it, Khushi had opted to go for a sleeveless square neck belted jumpsuit in red with a short jacket in beige. Inwardly she had sighed in relief as she sat down beside her sister in the taxi. At least the restaurant had been booked a week in advance. She promised herself, she would enjoy the rest of the evening with her sister and not once think about Rothwell Raizada. They paid of the taxi driver and made their way to Pind Balluchi. The doorman at the restaurant opened the door with a greeting and a smile, Khushi smiled back at him and greeted him back. A woman dressed in a saree came up to meet them with a smile. “Good evening. May I help you?” Said the woman. Startled, Khushi turned around and found her eyes meeting the amber ones of Arnav Singh Raizada. As I’d said, I would write the details of the travel that I recently made. I wish to remember this trip of mine for the simple reason that it taught me to appreciate life all the more. It taught me that in the face of adversity, one must persist to reach their chosen destination or peril may be the last option of life. Let me then begin with how it all started. Our flight from Bangalore to Delhi was uneventful. A simple chronology of taking a cab in the morning to the airport-stuffing myself with food and coffee and sleeping all through the flight takes care of that part of the trip. J By evening, we were in Delhi. Metros in Delhi are really helpful because we were able to leave all our luggage in the cloak room there. We took the Metro from New Delhi to Rajiv Chowk since it was the best route ahead for a little past time to Connaught Place. It is one of my favourite shopping places apart from South Delhi. Husband was groaning knowing that I’d be secretly making a list of all the things I wanted to buy from here. And quite right he was too! I had my favourite Cavender’s Milk Shake and mentally made a list of the things I would buy once I am back from the trip for a pit stop here. We also shopped for some patties, doughnuts and an assortment of biscuits at Wenger’s. When we returned to the New Delhi Metro, we collected our luggage and waited for the right time to go to the New Delhi Railway Station. It is a stone’s throw away from the New Delhi Metro Station. There is a Café Coffee Day inside the Metro station, thus an ideal spot for us to wait. Our train to Haridwar was at midnight. When the train arrived, we settled down and I instantly went to sleep while husband looked at me in stupefaction. I was so tired! *laughs* The train journey barely took four hours for we were there by 4:00 AM. It had rained a while back, leaving a nip in the air. If you’re ever travelling to Haridwar, be sure to handle our luggage with care and keep your head on your shoulders when dealing with Auto rickshaw drivers. They will quote you exorbitant amounts for taking you to nearby places, taking advantage of your ignorance of the place. Much as it smotes my heart to say it, I advise the pedal rickshaw since I find that they are the honest lot. We may be of tender hearts and not wish to take them on their services but they need to earn too. This is a way of life for them and they must have the opportunity to earn their bread. So we took a pedal rickshaw and went to the famous “Har ki Pauri”. 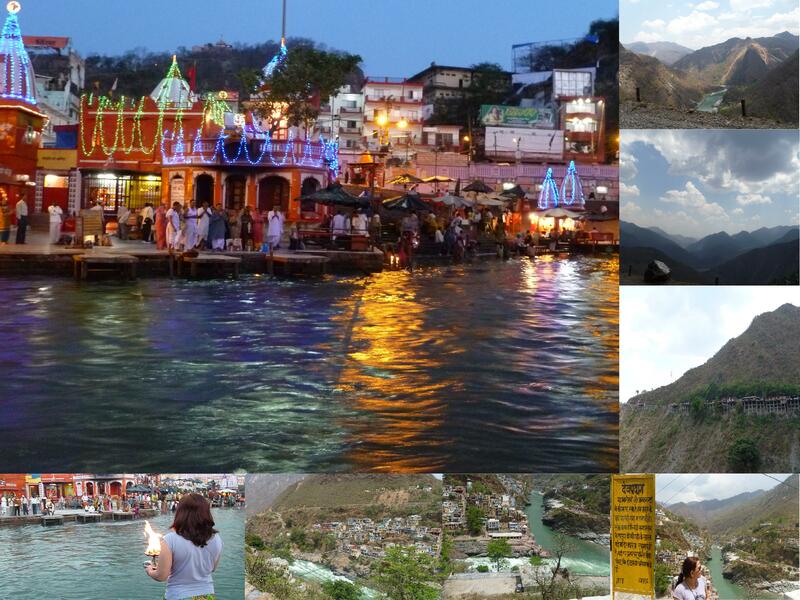 There is a story that surrounds the city of Haridwar and Har ki Pauri. This city is considered to be one of the seven holiest places that are visited by Hindus. The story of Samudra Manthan (Churning of the cosmic ocean) mentions Haridwar along with three our places where Amrit (Elixir of life and immortality) was dropped by the celestial bird “Garuda” while taking it to the gods. Ah yes! The other places I believe are Ujjain, Allahabad and Nasik. This are the four places where Kumbh Mela takes places. I was in Haridwar during the last Maha Kumbh in Haridwar in 2010. It is said that during the maha-kumbh, all those who come to bathe in the holy river Ganges are atoned from their sins and gain Nirvana. The place where Amrit drops had fallen in Haridwar is called Brahma Kund. Brahma Kund is today popularly known as “Har ki Pauri” literally translated to Feet of the Lord. The ancient Ganga temple is also situated here. The shops open by about 5:30 AM so we had to wait for our first cup of tea in the morning. In the meanwhile, we enjoyed sitting on the banks of the river that flowed in full strength. I love the cool breeze on my face. When I close my eyes, I can hear the river flowing, sparrows chirping and the sun just about to come out. Though there were a lot of clouds in the sky, nothing could hide the brightening sky. People had started gathering, taking a dip in the river, regardless of the cold that could chill the bones of the elderly. There is an “Aarti” in the morning at about 5:30AM. The guys associated with the temple roam about on the banks, looking for those who can contribute to the “Ann Bhandara”. It is a sort of program whereby what you donate goes towards feeding the poor on a daily basis. We contributed our share for the Bhandara and the aarti. Since we were the first people to be standing on the bank, the pujari gave me the opportunity to do the aarti with a huge lamp/diya and perhaps thousands (?) of baatis (cotton dipped in ghee/oil) in it. My heart was overwhelmed with joy at such a huge gesture from Mother Ganges. She let me worship her in place of other pundits! My husband who didn’t really believe in god and religion until a few years ago says it was the first sign that we received from Mother Nature that our trip was going to be eventful and unpredictable. After a hearty breakfast of Puri and Potato subzi, we met our driver who will be our companion for the next 7 days. It was time to go further up the Shivalik Range of mountains. What a lovely ride that was! Every where that one could cast their eyes on, one could see rocky mountain faces.We travelled the path of river Ganga and reached our next stop- “Devprayag”. Devprayag is the town where the rivers Alaknanda and Bhagirathi meet. Together they form the mighty river Ganges that flows down to Rishikesh, Haridwar and further. After resting for a bit for tea and snacks, we moved further on. The journey thus far was uneventful and pleasant. We were yet to feel the cold seep into our bones. We had to stop at Mayapur for the night, not very far away now. What awaited us there then? I shall write more in the next segment. Until then, Cheers! Enjoy the photo collage and leave loads of comments if you can please! 🙂 Thank you. © [Tejal] [2012-2013] All Rights Reserved.